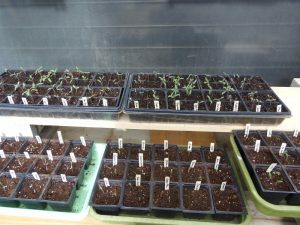 Starting tomatoes from seed is quite easy to do. By starting your own plants not only can you guarantee you have a particular variety and grow some unusual varieties, but you will have healthy plants to set out and share with others. Timing: Start your tomatoes beginning 6-8 weeks before you intend to set them out. Containers: You can use virtually any container that provides good drainage. Paper or plastic cups work as do plastic or peat cells or trays. Plant several seeds in each. This will not be the final container. Soil Mix: Use a lightweight sterile soil mix. It needs to hold moisture and yet drain well. Half peat and vermiculite is fine. You don’t need extra nutrients – the young embryo uses the concentrated nutrients in the seed. Germination: Moisten your mix slightly before planting., Plant seeds about 1/4” (7mm) deep and cover. Seed should emerge in about 3-5 days at a temperature of 75-80F / 24-27C degrees (minimum 50F / 10C, maximum 95F / 35C). In other words, the soil should be quite warm. An old heating pad set on low under the tray is what I use, but you can put them on top of the refrigerator or in the furnace room. A bit of plastic can be stretched over the top, but there must be some ventilation. Keep the soil evenly moist but not wet. Wait until the seeds have germinated to put them in the light and remove any cover. Growth: Once the hooks begin to emerge, immediately put the plants under strong light. In the winter at northern latitudes, even a sunny windowsill may not be bright enough. For stout plants, I use regular fluorescent shop lighting just an inch or two off the tops of the plants. The light fixture is raised as the plants grow. Tomatoes can use up to 12-14 hours of light a day, but more than 16 hours is not useful. 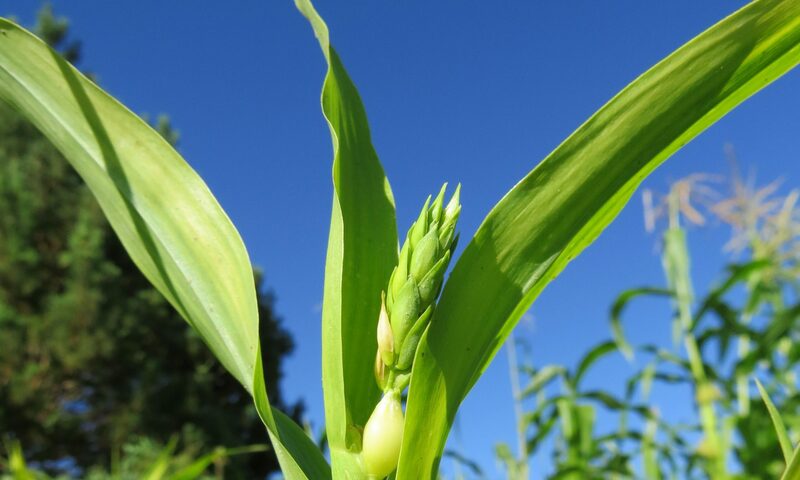 Optimum temperatures for this stage of growth are cooler – 60-65F / 15-18C. Allow the soil surface to dry slightly between watering, but never let the seedlings wilt. Sometimes the seed coat will continue to adhere to the cotyledons. Moisten a bit of cotton or paper towel and hold it on the head to loosen the seed coat. Potting Up: Wait until after you see the first ‘true leaves’. Then choose the strongest seedlings to move into the individual container where they will grow until planted out. This step is important because it forces the tomato seedling to develop a dense root system which will result in a larger and healthier plant during the growing season. At this point you can fertilize the seedlings as you water them in. I use a tea made from worm castings, but anything that provides a little phosphorus will work. Cooler temperatures, even as cool as 55F, bright light and even moisture are the secrets to avoiding weak and leggy plants. I also run a small fan to strengthen the stems. Hardening Off: Almost done! A week or two before planting out, begin acclimating the young plants to the sun, wind, and temperature variations they will face. It is easy to burn the tender leaves, so a sheltered spot and some shade cloth is helpful initially. The time is increased from an hour or two a day to all day over the course of this treatment.